Homespun Stitchworks..... For the love of vintage: Embroidery and that vintage look! It can also, of course, represent nothing at all! I like the above quote a lot. It is so true, your embroidery can be formal or in a crazy kind of style depending on your likes and dislikes. Take free motion embroidery on things all done in black cotton, I am sure my needlework teacher at school would have fainted! It is a very personal thing, and beauty is always in the eye of the beholder. I however am in the middle here, I do like subtle colours and the vintage look and of course that is not for everybody. Vintage however has become very popular and as I have said before young people are wanting the look, in the hair and clothes, and also prefer to buy from second hand shops and boot sales. In addition they are looking for handmade goods as well as wanting to learn how to make themselves. Going to every vintage fair that I can at the moment, I have noticed young people in there late teens, early twenties dressed in forties clothes. Girls in lovely dresses and a hat. Boys in hats and shirt and braces...... I will ask next time if I may take photos and put them on here for you to see, because they look so good. I also like finding vintage embroidery on stained table clothes and then cutting those up to stitch on to things as well. With some of my work I favour applique and embroidery together and it really seems to bring dimension to a piece. I enjoy playing with ideas on scraps of fabrics, It is really a good way of seeing what you like and what you don't. It is not ideal to be unpicking on delicate fabrics unless you really have to. Anyway I must away and start my stitching day, In the garden if it stays nice or sat in my sewing room which looks over our back garden. Even if it is raining it is a great view. I also know (although can not quite see) that the beach is not far away either and that is another great source of inspiration for me. 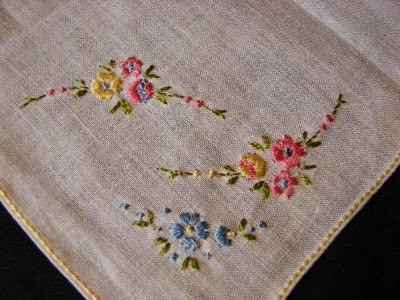 Vintage embroidered hanky ..... it is beautiful is it not! I love it when visitors to a fair 'dress up'. They make the day all the more interesting! Did you know Bridport Vintage Market is back ... this Sunday 25th. Always used to be a good one and great for 'people watching'. Thank you I did not know! and I do like to people watch :) With the vintage fairs that I have been visiting it has been wonderful to see people looking so good and beautifully presented..... Thank you for your comment.